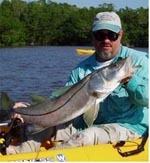 "Dedicated to fun and the experiential education of students, families and travelers from Florida, the Americas and the World"
Everglades Area Tours and Chokoloskee Charters is proud to provide Guided Kayak Fishing trips into the Everglades National Park, 10,000 Islands, and Chokoloskee and Big Cypress Preserve. 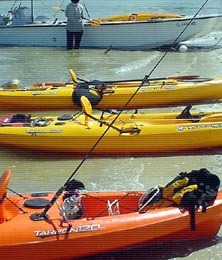 Kayak fishing is the fastest growing segment of the sports fishing industry. Anglers have come to realize what a wonderful fishing platform the fishing kayak truly is. It provides stealth in shallow water unmatched by even the quietest of flats boats. With a fishing kayak, you can access areas that no others can reach. Whether fly fishing or fishing with traditional gear, kayak fishing is a great way to catch fish while enjoying the beauty and wildlife of the Park. We offer paddle-in trips where we launch from land and paddle directly to the fishing grounds, however, our most popular trip is our guided mother ship kayak fishing trips aboard the transport vessel the Yak Attack. On these mother ship trips, anglers, kayaks, tackle and gear are transported deep into the Parks core for a day's fishing. All long paddles are eliminated and we are back in time for dinner at a local restaurant. Chokoloskee Charters maintains a fleet of state-of-the art Redfish 12's by Heritage Kayaks. Extremely stable and completely rigged for fishing, we provide you the best equipment available to fish and access these remote areas. Kayak and equipment rentals, privately guided kayak fishing trips, regularly scheduled weekend trips that are open to any angler are offered. Trips are limited to six anglers so reservations are required. The transported mother ship trips on the Yak Attack are just $225 per angler and include transportation, guide services, outfitted kayaks and all safety equipment. Click Here for interesting articles about fishing the area.